Washington Island, Wisconsin, this 300,000 litre capacity batch distillery has taken its glorious surroundings, namely 700 miles of uninterrupted beaches and shorelines and reinvigorated island life and created something rather spectacular. With eyes on sustainability, local employment, organic certification and an interesting story they have created a distinctive liquid that stands out from a lot of other options out there. Now, most Gin hounds will know that Gin brands often proudly display numbers on their bottles to indicate how many botanicals they have used in the distilling process. 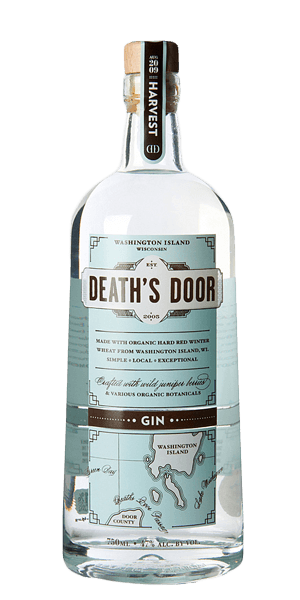 Death’s Door Gin has gone the opposite way and proudly boasts of using just three; organic wild juniper berries, organic coriander and fennel seeds, all having their flavours extracted using high-tech temperature-based processes that typify the innovative nature of craft distilling. The result? A complex and evolving flavour that will take you on a journey sure to tease the tongue, from spices to cooling sensations, this is not your average Gin. With an ABV higher than you’d expect for even a premium Gin, but still super smooth, explore how you enjoy Death’s Door in cocktails, especially martinis. You’ll thank us. Cheers! What does Death's Door Gin taste like? The Flavor Spiral™ shows the most common flavors that you'll taste in Death's Door Gin and gives you a chance to have a taste of it before actually tasting it. Uplifting finish, spirited jam-like flavours with peppery hints again. An unusual spirit with the soul of the wintery north! Strong on juniper and floral.